Area C or Limited traffic zone (ZTL) is located in the old town area of Milan, and involves access limits for certain types of vehicles, mainly affecting private vehicles. Traffic limitation in Area C is as follows: Monday, Tuesday, Wednesday and Friday, limited traffic from 07:30 to 19:30. On Thursday, traffic is restricted from 07:30 to 18:00. 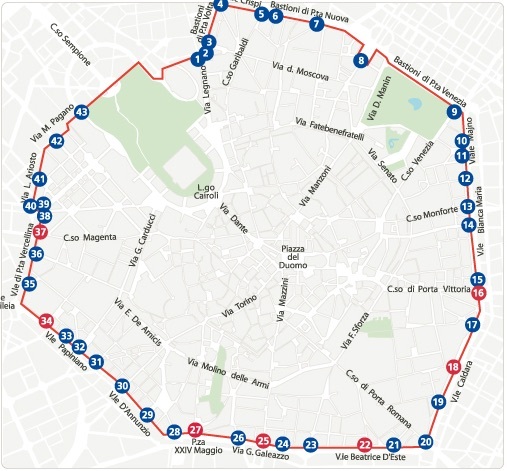 It is important to know that these limitations are not active at the weekend or during holidays, when you can access the centre of Milan without restrictions. In addition, the Municipality suspends Area C limitations over major holidays such as Christmas or New Year. Here you can find a detailed map of the Limited traffic zone (ZTL) Area C. Parclick offers you the best options for parking in the Limited Traffic Zone of Milan. Check the map and book in advance what's right for you! 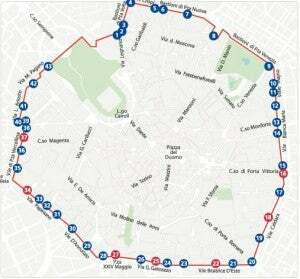 More helpful information about Area C in Milan will soon be available! Free access: for both electric vehicles and mopeds, and for any vehicles transporting patients to the emergency rooms of hospitals. Until 31 December 2016, access is free for hybrids, bio-fuel cars, and vehicles running on natural gas. No access: Access is forbidden for diesel vehicles with Euro 0 or for any gas-oil/diesel engines with Euro 0, 1, 2 and 3. Access is also forbidden for vehicles exceeding 7.5 metres in length from Monday to Friday from 07:30 to 19:30. Paid access: Other vehicles can access Area C by paying a corresponding fee, which is € 5 per day (ordinary day). You will pay a fee of only € 3 per day (ordinary day). You can pay the fare and activate it on site once you have arrived in the car park. Without any hassle. We inform you that you have to buy and activate the ticket before midnight on the day you access the Limited traffic zone (ZTL). How can you pay the fee to enter Area C? Authorised dealers: tobacco shops, kiosks, ATMs. The ticket must be activated manually after purchase. By calling the Area C call centre on 39 0248684001, open every day from 07:30 to 24:00. The ticket is automatically activated upon purchasing. ATMs of Banca Intesa San Paolo. The ticket is automatically activated upon purchasing. Parking meters with payment by cash card, credit card or in coins. The ticket is automatically activated upon purchasing. In the city centre, a premium parking space allows you to move around on foot. Out of the centre, a parking space with cheaper rates allows you to get around on public transport. The few parking lots in the centre of Milan are usually full, so we recommend booking early to avoid mishaps. With Parclick parking in the heart of Milan is easy and quick. Parclick is present in more than 120 European cities.